That quick tease Activision gave this morning of Call of Duty's new maps "doesn't look anything like Call of Duty," I said. Well, there's a reason you're lugging around a fire axe. 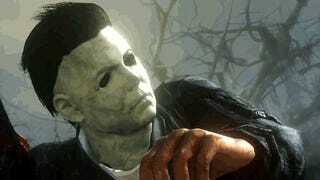 One map, "Fog" will turn you into Michael Myers, the killer from Halloween. Completing a field order in fog turns you into the bogeyman from the famous slasher flick, and may reference the emergent game type CoD fans would mutually agree to play in Team Deathmatch in which only knives were allowed. Other maps will award an artillery strike from warships in the harbor, or the opportunity to trigger a rocket engine (in a map based on one from Modern Warfare 2.) Bayview also offers everyone a sentry gun positioned in a mobile trolley car. You can see what the other four maps have to offer, plus "Nightfall," the first epsiode in a new miniseries based on the Extinction mode. This is all great and interesting and looks like fun but I really have to wonder at what point Call of Duty is no longer Call of Duty and is instead a series of mods, one of them being a military shooter.